In the moving world, some items are easier to move than others. Generally speaking, the most difficult belongings to move are usually your furniture and your bed. They tend to be heavier and far more cumbersome, which can make them a moving nightmare. As the premier Kamloops movers, we would like to share the following tips on how you can move your bed hassle-free. Set a time frame. Leave enough time to disassemble your bed frame and headboard as well as time to move the pieces. Make a list and prepare the proper moving materials needed to move the parts of your bed. Arrange movers or find an extra set of hands to help you move the mattress and other parts of your bed. Measure all door frames and corners to make sure that you will be able to move each part of your bed out of your old home and into your new home. Ensure that you have the room to accommodate your bed, box spring, frame and headboard. Do not tie your mattress to the top of your car. A mattress bag. A durable plastic mattress bag will protect your mattress from scuffs, stains and even rips or tears during transport. Moving blankets. Wrap all the frame parts as well as your headboard in blankets to prevent scuffs, chips or other damage. Make sure to label and attach all bolts and fasteners to the bed frame and headboard, so that they are not lost during the move and are easily accessible when you need to reassemble your bed in your new home. There is a step-by-step process that will make moving your bed easier. 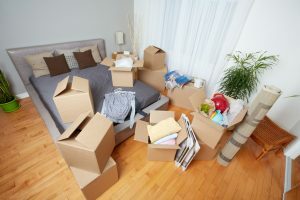 Pack all your bedding and sheets into boxes, properly label them and pack these boxes away. Move your mattress and box spring into another room to open up more space for the next step. Disassemble your bed frame as well as your headboard. Consult your manuals if needed and package and attach all necessary bolts etc. so they are not lost during the move. Carefully move each piece out of your home and into the moving van. Make sure that every item is properly wrapped and secured to prevent any shifting or damage during the move. These simple steps will allow you to move your bed without any damage or difficulties. If you would like more tips on how to move your bed or are interested in some of the moving services that we offer, please contact us today. We look forward to being a part of your next move.